As portable electronic devices have become smaller, lighter, and more sophisticated, the batteries that power these devices have had to provide ever increasing levels of energy. Nickel metal hydride batteries provide such a solution with a nickel hydroxide positive electrode and a negative electrode comprised of hydrogen absorbing alloys. Because NiMH batteries have roughly double the energy density of nickel cadmium batteries with the same operating voltage, these batteries have become a mainstay in the world of rechargeable batteries. The nominal voltage rating of the Nickel Metal Hydride cell is 1.2V, with energy usable in the range of 1.0V – 1.45V per cell. A variety of cylindrical cell sizes are available, providing a capacity range from a few hundred mAh to above 10Ah. 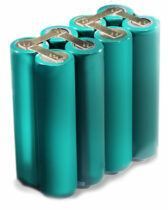 Nickel Metal Hydride battery packs are able to accept charge and discharge rates as high as 1C (typically equal to the rated capacity of the cell). As a result, products are able to perform challenging tasks and require minimal time to recharge, reducing downtime of the portable device. Contact us for assistance with configuring a NiMH battery solution, as well as providing an appropriate battery charger that is ideal for your application.